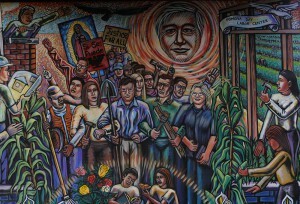 Mural at the Pomona Economic Opportunity Center, one of CEC’s core partners. Claremont, Calif. (June 15, 2015) —Pitzer College was named to the 2014 President’s Higher Education Community Service Honor Roll by the Corporation for National and Community Service—the seventh time Pitzer has achieved this distinction. The honor roll highlights colleges and universities dedicated to fostering civic engagement and working with communities to solve problems. Pitzer College was recognized for “the extraordinary and exemplary community service contributions of its students, faculty and staff in meeting critical community and national needs.” On average, Pitzer students, faculty and staff commit more than 100,000 hours to community engagement projects annually. At Pitzer, 100 percent of students engage in academic service learning or community service before graduation. Pitzer has been dedicated to building a better world since its founding in 1963. Today, Pitzer’s Community Engagement Center (CEC) puts the College’s commitment to social responsibility into action by integrating work in the community with work in the classroom. Through CEC programs and partnerships, students tutor women recovering from drug and alcohol abuse, hold poetry workshops with at-risk youth, write grants with local Native American tribes and teach day laborers English. “Integrating academics and community engagement delivers greater student leadership development, enriched learning and improved academic performance through facilitating the creation of meaningful connections between practice and theory,” Morgan said. For more information about Pitzer’s Community Engagement Center, please visit the CEC website.